Mercedes Lawry has published poetry in such journals as Poetry, Nimrod, Prairie Schooner, Poetry East, Natural Bridge, and others. Thrice-nominated for a Pushcart Prize, she’s published two chapbooks, most recently Happy Darkness. She’s also published short fiction, essays, and stories and poems for children and lives in Seattle. The verb in this poem is conditional: not a statement of will but of desire. That choice doesn’t rob the poem of its power—the speaker’s passion is formidable—but it does change how that passion is focused. Instead of action, there is intent. Instead of resolve, there is a wish. It reads like a flirtation, the kind of mental dance we do when we want something amazing but we’re afraid of how much it will hurt to pursue. How inspiring to be found by birds, to be a haven for them instead of a predator! And yet, is it possible that swallowing a tree could be anything other than painful? Here, bone becomes “eager green,” a place where birds feel welcome. 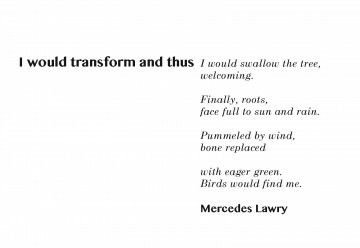 For the body of the poem, then, the typeface needs to reflect the movement not just of transformation, but of the tree the speaker wishes to become. Many of Century Schoolbook’s lower case letters have upturned serifs that could be tendrils, and the angle of its italic form looks like it could’ve been produced by a light breeze. In contrast, the thick uprights of Sinhala convey the strength and rigidity of the old bone.